Altera® HSMC defines electrical and mechanical properties of a high speed mezzanine card interface. This specification standardizes the way in which mezzanine cards communicate and connect to host boards. 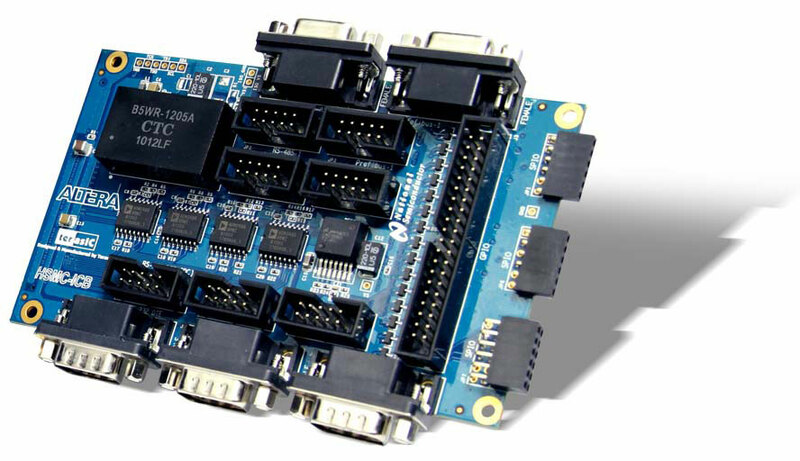 By taking advantage of the high-performance I/O features found in today’s FPGA devices, manufacturers can build a single mezzanine card that will then interface to multiple host boards. Similarly, they can build a host board that can leverage many different, pre-built, mezzanine cards. The HSMC connectors defined by the specification are based on the 0.50 mm pitch Q Strip® QSH/QTH Series high-speed board-to-board connectors from Samtec. These connectors are partitioned into three “banks.” Bank 1 in each respective connector has every third signal pin removed to allow for multi-gigahertz differential signaling. Bank 2 and Bank 3 in each respective connector have the entire rows of signal pins filled for various single-ended interface signals. Terasic’s ICB-HSMC (Industrial Communication Board) was designed with industrial communications in mind. ICB allows for serial communication protocols to be sent in real-time. This results in reliable distributed control in applications such as automation and instrumentation.